50 years of 48's - Happy birthday 4801. 4801 at A.E. Goodwins St Marys. 28th August 1959. R G Preston photo. 50 years ago on August 28, 1959, loco 4801 was presented to the NSWGR by builder A.E. Goodwin at a ceremenony held at their St Marys construction plant. A few days later on September 1 it was delivered to its owners the NSWGR at DELEC and commenced trials and then its working career. 4801 at DELEC September 1, 1959. R G Preston photo. During their service life the 48 class have proved to be extremely reliable units as well providing the flexibility to haul all types of trains over all lines in the NSW rail network. Despite having worn many different liveries and undergone various modifications their basic configuration remains the same as when first delivered. 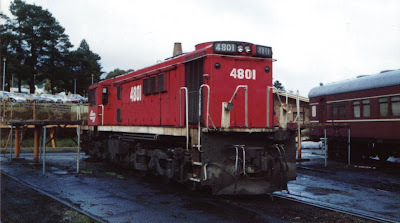 4801 at Lithgow loco depot in 1993. J McIntyre photo. To this day many 48 class units continue to operate in daily service while several have also been saved for preservation. 4801 is included on the RailCorp Heritage Rollingstock register but is unfortunately not operational. It is currently stored facing an uncertain future with classmate 4805 and can be seen from passing trains at Eveleigh Carriage works.